The Coalition of CSOs on Good Governance in Nigeria has raised the alarm over what it described as grand plot by some paid agents of unpatriotic politicians towards dragging the Nigeria Military into the murky waters of politics with a view to heat up the polity and causing untold distractions in the ongoing Boko Haram War in North East Nigeria. The group accused one Dr. Idris Ahmed and some other elements of planning to tarnish the hard-earned image and reputation of the Chief of Army Staff, Lt. Gen. Tukur Buratai . The CSOs also cried out over the alleged plan to thwart the progress that have been made in fighting terrorism and return Nigeria to the days when road in major cities have to be sealed off with concrete boulders. 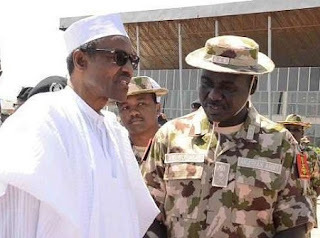 Evangelist Gabriel Donko, National Convener, in a statement obtained on Tuesday, said Ahmed and his paymasters called for an outright sack of the Chief of Army Staff and some frontline commanders in the Theatre of War, it also smacks of mischief, abetted by pecuniary gains. “This makes us wonder how much blood they are willing to get on their conscience and that is assuming this is a concept they are familiar with,” Donko said. The statement noted that the smear campaign is not only futile, it is of poor taste and laced with ulterior motives because of the personalities of the characters involved. He said, “The point when the President of the Federal Republic of Nigeria begins to act on the tantrums of these kind of inconsequential urchins then the end has come. Thankfully, nothing on record suggests that the ill-advised clamour would be treated higher than the nonsense that it is. “These characters are indeed men of low moral standing in the society, whose stock in trade revolves around propaganda, blackmail, and extortion. We had it on good authority that the demands for the sack of the COAS was the direct outcome of a refusal to pay Dr. Ahmed and his co-travellers money in 10 digits as was being demanded. “The Coalition of CSOs on Good Governance in Nigeria wishes to use this medium to inform the general public of the nefarious activities of Dr. Idris Ahmed and, his group of marauding elements which from all purpose and intents do not wish for the war against Boko Haram insurgents to come to an end for their selfish reasons. Since their meal tickets are tied to the continued existence of Boko Haram, we strongly suggest that they earnestly seek out new food sources as the Boko Haram channel is one that has now been guaranteed to run dry in the coming months owning to the superlative manner in which the Nigerian Army under General Buratai has dealt the terrorists repeated devastating blows. “And for the purpose of clarity, the Nigeria Army under the leadership of Lt. Gen. Tukur Buratai has catapulted professionalism to the point where its institutional ethos and mission has seen significant improvement in the last three years. Discerning Nigerians and indeed any right thinking person on earth will at some point pitch media reports against the reality on ground, save for the few bad eggs whose activities cannot be excused from being influenced by subversive interests, the unbiased observer will find an Army that has been improved in hardware and welfare for its personnel. “On the issue of massive corruption as enumerated by Dr. Idris Ahmed, it is more of an act of ignorance and mischief because the anti-corruption war introduced within the army has seen all officers declaring their assets and also the introduction of a transparent procurement process. It is most unfortunate that those who handed him the brief to malign General Buratai omitted to inform him that the corruption tag was one that never stuck on the General because the corruption they allege against him could only have been conjured by a fevered imagination. The Army as an institution has also evolved to embrace best practices in its process and cannot be the same as when those paying Dr. Idris Ahmed held sway there. “The Coalition of CSOs on Good Governance in Nigeria not only frowns at such attempts to paint the Nigeria Army in bad light, but it also wishes to alert the various security agencies of the activities of Dr. Idris Ahmed and his paymasters, who have so decided to constitute themselves into clogs in the wheel of our progress as a people and as a nation. All the services should be at alert as Dr. Idris Ahmed and his co-travellers will in the coming days intensify their efforts at doing damage to the Armed Forces. This manifest in form of sabotage, impersonation, sponsored mutiny and not ruling out copycat terrorist attacks to create the impression that the military has lost control of the situation. “We at this moment call on well-meaning Nigerians to continue to extend their support to the Nigeria Military towards winning the war against Boko Haram Insurgents and entrenching an era of peace and tranquillity for sustainable development. It is up to Nigerians to send characters like Dr. Idris Ahmed on retirement and make the well-deserved peace in Nigeria long-lasting.